Hello amazing people. Casey here! How are you? I have something special today. 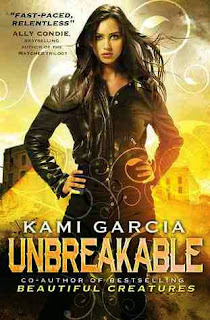 The co author of THE BEAUTIFUL CREATURES Kami Garcia is here on Dark Readers blog today to do a guess post for her awesome new book called UNBREAKABLE, which is released in the UK NOW! and is bloody amazing! fans of City of Bones by Cassandra Clare will love this! When Kennedy finds her mother dead, her world begins to unravel. She doesn't know that evil forces in a much darker world are the ones pulling the strings. Not until identical twins Jared and Lukas Lockhart break into her house and destroy a dangerous spirit sent to kill her. The brothers reveal that her mother was part of an ancient secret society responsible for protecting the world from a vengeful demon - a society whose five members were all murdered on the same night. Now Kennedy has to take her mother's place in the Legion if she wants to uncover the truth and stay alive. Along with new Legion members Priest and Alara, the teens race to find the only weapon that might be able to destroy the demon - battling the deadly spirits he controls every step of the way. 1. Rock Salt -- For lining windows & doors to keep spirits away. 2. Electromagnetic Field Meter -- To detect spirit activity. 3. Sharpie -- For drawing protective symbols. 4. Infrared Thermometer -- To measure extreme changes in temperature (lower temperature can indicate spirit activity). 5. Cloves and Holy Water -- To destroy spirits.